Immersed in the quiet spaces are the remaining vestiges of French in Ba Vi, such as the colonel mansion, the collapsed church and the political prison. Located at an altitude 1,100 m above sea level, the climate in Ba Vi, Hanoi is fresh and cool all the year round. Only 70 km away from Hanoi so right from the early 40s of the last century, Ba Vi was chosen by the French to build resorts for senior military officers. Today, with over an hour by vehicles, such as motorcycles and buses, Ba Vi becomes a compelling destination for weekend for visitors who want to find the oasis of peace. For young people who are passionate about photography, the remaining French architecture in Ba Vi becomes the creative inspiration. There are many paths to Ba Vi but if you depart from Hanoi, the Highway 32 through Son Tay town is the fastest route. Through the 0km landmark of the ticket checkpoint of the Ba Vi National Park, you will begin the journey through the winding tree-lined road, with steep bends. The collapsed Ba Vi church is a favorite destination of many young people. Photo: skycrapercity. Like Da Lat, Sa Pa and Tam Dao, the French built many villas in Ba Vi, at landmarks 400, 600 and 1,000. The only difference is that they have been destroyed by the vicissitudes of time and life. Therefore, visitors will be surprised about the architectural foundation left from over hundred of years ago before going into the woods. The resorts, the stoves, the walls, all are covered by forest and mountain dew. At landmark 600, the colonel palace is a typical French-styled work in Ba Vi, which is still quite intact. It has a barbed wire fence, stone walls of over 2 m high, 0.5 m thick and some submachine gun emplacements. Going up a little more is the summer camp for children of France and the colonial government officials, including four rows of houses built with rock. Located amid the natural forests with big trees such as oaks, chestnuts, ca lo, khao, etc, with hanging orchids above, the landscape here is poetic and magical, attracting tourists to visit and take photograph. 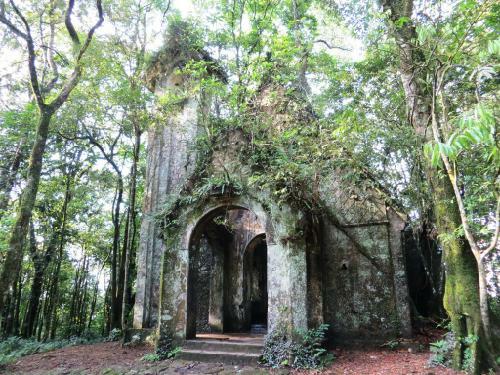 The collapsed church is located at an altitude of 800 m, amid the jungle. Abandoned for years, the roof of the church has gone, leaving the bare cathedral in the forest. On the walls, the cross covered with the color of nostalgia, with afternoon sunlight through the window. Here, the fog always exists, occasionally swooping down and engulfing the church. The green color of moss, the gray color of mold, and the silver color of mist create a magical space. 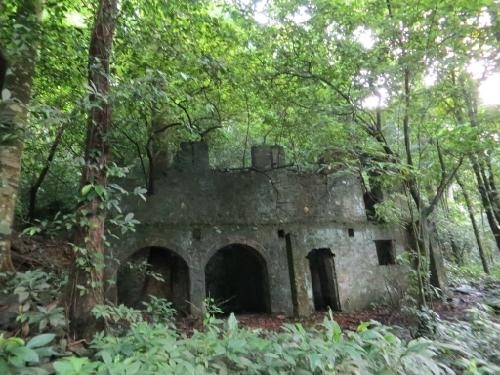 The vestiges of the Ba Vi mountain prison. Photo: thanhnienviet. Only moss walls are left, covered by grass and trees, but with what is left, one can still imagine the wild beauty of the church in the pine forest in the heyday. Today, thanks to the crumbling beauty, the collapsed church in Ba Vi becomes a favorite site for photographers. At landmark 800, the French also built an orphanage with doorways and arches of distinctive architecture. In particular, at an altitude of 1,000-1,100 m in the western slope of the Tan Vien peak is the system of political prisons which are built solidly to imprison revolutionaries. The prison is arranged into three zones: zone 1 for the wardens; zone 2 and zone 3 for prisoners. 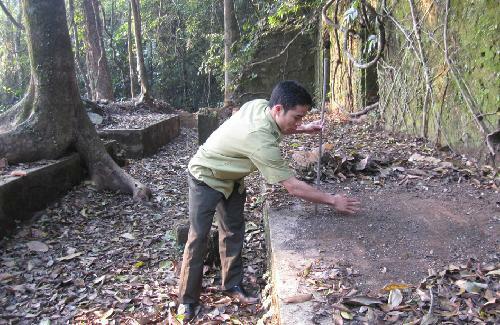 With a total area of nearly 1,000 m2, the prison system in Ba Vi can detain 100-200 prisoners. Covered with dust and leaves, the French works in Ba Vi always have their own charm, leaving good impression in the eyes of visitors.